One of the most important and authoritative books that was written by Lieutenant Colonel Hüseyin Hüsnü Emir, Turkish General Staff, a Turkish officer at the centre of major historical events in Palestine from 1917 to 1917. The book he wrote was called Yilderim which translates into English as either "lightning" or "thunderbolt". This was the name given to the Army formed under the command of General Falkenheyn in 1917. It fought in Palestine until the cessation of hostilities. 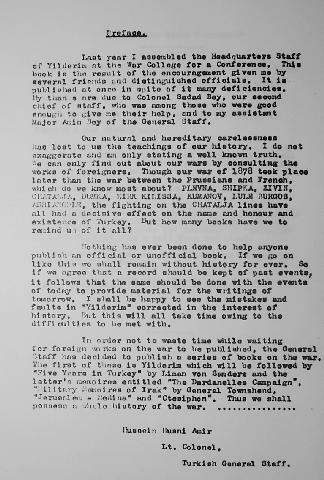 The book was 1st published in 1922 in Ottoman Script by the Turkish General Staff War History Department in Ankara. At that time, Turkey was in a state of internal chaos. Mustafa Kemal Pasha was still fighting against the Greeks and British. Hüsnü completed his book on 1 May 1921 in occupied Istanbul and joined the National forces of Mustafa Kemal Pasha in Anatolia with the manuscript. The 2nd edition was published in 2002. The translation presented here comes from the 1st edition. Every day, one page of the book will be posted. This way, researchers unable to access this valuable resource will be able to see the war as it was fought on the other side of the trench, an important element in producing a balanced account of a particular action. Note: Additional information about Hüsnü was kindly provided by the Turkish author, Tosun Saral. Many thanks to his kind assistance.